CurveEQ, Software parametric EQ from Voxengo. Voxengo CurveEQ update version 3.5 is now available for download, adding ProTools 12+ AAX-64 support. 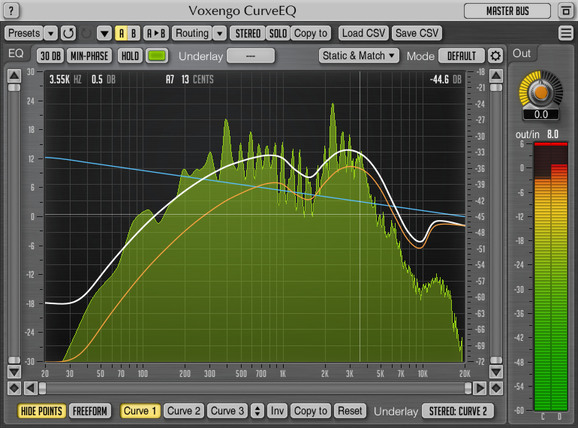 The Voxengo CurveEQ spline equalizer plugin's update version 3.5 is now available for download. It includes AudioUnit, AAX, VST and VST3 plug-in formats (including native 64-bit support) for Mac OS X (v10.6 and later) and Windows systems. Reduced flicker on plugin window opening. Added curve scaling factor readout. Added internal filter calculation parallelization for faster visual response. CurveEQ has a MSRP of $89.95 for new customers. More details and demo version are available at Voxengo's website. 25% off Presonus Studio One 3 DAWs In June, Presonus offers 25% off Studio One 3 Artist or Studio One 3 Professional, including upgrades, crossgrades, and educational versions. Cakewalk's Sonar to go OS X Cakewalk has announced the future launching of a public OS X alpha test phase for Sonar. Cakewalk announces Sonar Platinum lifetime updates Cakewalk announces a limited time offer of Lifetime Updates for Sonar Platinum.